Call 1.800.330.8820 or click here to have a Mediterranean Travel Specialist contact you about booking this luxury Mediterranean cruise that takes you to ports in Israel, Egypt and Italy. Enjoy the savoring the food, wine and lifestyle the Mediterranean has to offer. 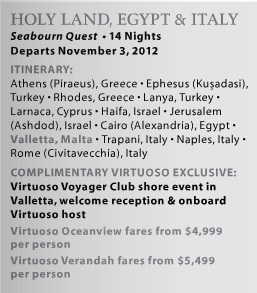 Mention promo code VNL to access the luxury cruise deal listed above. ~ by travelwizette on July 10, 2012.